Big event this year was going to Miku Expo in Los Angeles. It all started early in the year when I was talking to a coworker at lunch. He mentioned Miku was coming to the US this year and if I wanted to go. Without hesitation I was like hell yeah. I'm not so much a fan of Miku herself but the idea behind it fascinated me as well as the tech that was used to have her appear on stage. So we get back to work and he messaged me an hour or so later he bought the tickets. Being super excited I asked what the date was and where at and said he booked the first concert and it was in LA. My initial joy turned in to panic. I live in Ohio. Los Angeles is about 2,400 miles away. It's about a 5 hour flight. The last time I was on a plane was back in 2006 when I went to Japan. I've never traveled anywhere west of the Mississippi other than in airports. Main concern was dealing with TSA and making sure I have everything packed properly. Well after he said it was in LA we both came to this realization that now we have to work on flights and hotel and such. So we got all the details figured out and a few grand later we were all set. It's also worth mentioning that while I've been over this persons house before to watch movies and such I haven't spent an extended amount of time. As the trip to Japan taught me two people that seemed to get along fine once you're stuck with them for extended amount of time can get annoying. But at the same time if this did work out maybe I can pick up traveling again and have someone to go with me as stuff like hotel rooms cost the same if it's one or two people so you can individually save half the cost vs going by yourself. There were several firsts during this trip. Aside from what I mentioned thus far it was also my first time using a ride share service and we were going to use it the entire time we're there. I live fairly close to the airport and didn't want to bother anyone to come out and take me so I even used it to go from house to airport. I used Lyft the entire time. I installed both Lyft and Uber and comparing the two Uber always seemed to be slightly more expensive or not a lot were around me. At any rate I highly recommend using ride sharing if you ever visit LA. Not dealing with traffic was absolutely worth it. Plus it really wasn't that expensive. I've already been going on about this but all I'll really say about the concert itself is it was far better than I realized. Like I wish we got VIP tickets and be all the way up front. The projection technology looks way better in person. There's several times where I forgot I was seeing a character being projected on to a piece of special glass. Far and away this was the most spontaneous thing I've ever done in my life and I'd absolutely do it all over again. Maybe this will be the kick I need to travel more? One other interesting thing we didn't realize at the time we booked everything but the following week was Anime Expo which is one of the biggest anime conventions in the US. If we realized it we would have stayed another week but to make the changes while we were already there would have cost way too much. Also if in LA check out Little Tokyo. We were there pretty much every day eating some place different. Anyway maybe I'll expand on this all in a later post but in summary, it was fun. While I got some pictures and video we were further back on first floor. But someone recorded the entire thing from the VIP area to give an idea of what it was like. Like I said the display technology doesn't translate well to videos, guessing the higher frame rate isn't captured right or something. Didn't do many shooting competitions this year. No real reason other than wasn't too motivated so just took a break this year. Maybe I'll get back in to it next year. I just did the final step for coralize.net and killed the hosting service for it. Hopefully anyone that has used it has reverted back to using a direct url. Notable things I mentioned last year that I said I was going to do. First off I haven't done anything to this website. The captcha form still seems to work I think. Still not sure what I want to do with this site. Don't want to move it to wordpress because I'd have to constantly keep it up to date. May try one of those site generators that generates a static site. Check back as the end of the year came up really fast it seemed so I'll likely be updating it (and rss reader isn't going to see the updates. Assume I'll have everything said I wanted to by first week of January). As always I'm on twitter and github. Keeping up with tradition I haven't really done anything I mentioned in 2014 year in review. Notably this year I was let go from the job I've had for 10+ years. It's a little hard to give a real number since it's rather complicated. I was hired back in 2004 as a PHP developer. I was working for a company that was a spinoff the of the main company. Well it then broke off from that company into another one (yes, it's confusing, and made taxes fun a couple years). That company was founded in 2006 or so but I still worked with the same people throughout. At any rate when this company started I was one of 5 people, including the boss. When I left it was over 40 I think. Had a lot of growing pains and put in a lot of hard hours. Anyway this year they did some restructuring (leaving out details as I'm not sure if it's considered confidential info still) and remove my position as well as several others in department. Don't have any hard feelings towards them and I wish that company the best. The job hunt now was a lot different from back in 2004. Pretty much every resume I sent out I at least got a call back from. Apparently the Cleveland area is starved for Linux Administrators. After only two months being unemployed I accepted a new job. Took like a month and a half to finally get in there (they were recently acquired so they weren't used to the new process things had to go through). New job operates in the health care industry and has a really interesting part in it. Also this company is a lot bigger at almost 200 people which has been great to not have to do everything all the time, or be on call 24/7/365 since it's spread across like 12 people or something. Have been getting along with coworkers well which was my big worry starting at a new place and doing more stuff that I wanted to do. Due to leaving the previous job, which was where I had this server hosted, I had to move things around. Ultimately I went back to using my Dreamhost account. It's definitely improved since I last used it. I'm still looking at getting a hosted server somewhere because they do some stuff with email that I don't like, also can't tweak spam settings like I can with my own server. I did some updates to permit cookies addon. I'm looking at updating it again because the API it's using is so old Mozilla is planning on deprecating it soon. Shouldn't be too hard to rewrite but still annoying. I ended up dropping my ".email" TLD. Two years later and still have a lot of sites not accepting it so I'm using toddeddy.com which I've had for a while now. I've even been considering moving this site over to toddeddy.com since it's always been hard to give out my domain name since I have to spell it out and such. Still have to spell out toddeddy.com but at least then someone will know how to spell my name. Not sure if I want to do that though. Also I want to maintain all redirects so even 10 years ago you type in the url of this page and it will redirect you to the appropriate place on new domain. Still haven't done much with site rewrite. Just changes to a local copy of site. Other things I did this year was go on vacation to Pigeon Forge, Tennessee with parents. It's become a really big tourist trap place though. I did end up doing this blacksmith thing where I made a pretty cool knife out of a railroad spike. Also have made an attempt at trying to get house cleaned up, took a bunch of old computers to recycling place this year. Been hoarding them for close to 15 years so I'm glad to be gone with them. In 2016 I'm looking forward to being in better shape. Don't have any real concrete goals in regards to working out. Just be in better shape. Things like losing weight are going to happen. I have been considering moving. Current place I live is all right but it's kinda old. If I want to bring it up today, open floor plan, etc it's going to cost a lot. Rather just go somewhere that's newer and have all that done already. Also I've seen enough of those home remodeling shows where they find beams missing or pools of water that I don't want to do work on my place. Probably won't go anywhere but I've been looking at least. I'm still on twitter and github a lot and probably best places to see what I'm up to throughout the year. As usual most of what I mentioned in 2013 recap I didn't actually do. While I have been working on moving site over to django it's been slow going. Work has been keeping me busy. I do still plan on hosting images locally and moving the site to https everywhere. Especially since the EFF and several others are working on making basic ssl certificates available for free. I'm fully verified at CACert but I still don't think any browsers actually have their certificate installed by default. Some things I did actually do though, I moved my home servers to a single HP Microserver N54L running VMWare ESXi. Been working nicely and like that now I just have this single small server instead of just using my old desktops computers. Also I did create a new PGP key, you can get the new one on my contact page. In 2013 a new TLD, ".email", was available and I thought maybe if I got a lastname.email domain I could setup email on that since I always end up having to spell out "vrillusions" when I give my email anywhere. Now the problem is a lot of websites don't think "user@example.email" is a valid email address. So for the time being I'm using both addresses. I'll never get rid of "vrillusions.com", but was hoping to phase out using it for email though. Most of my spare time has been spent doing stuff for work. One notable thing is I got very familiar with how Amazon's AWS services work. We deployed a new environment that's entirely hosted in aws and has high availability and auto scalers and all that fun stuff. To say it's been a lot of work is an understatement but it has turned out pretty well. Haven't really been doing much in the way of photography as of late. For whatever reason I haven't really been too motivated to go out and take pictures. 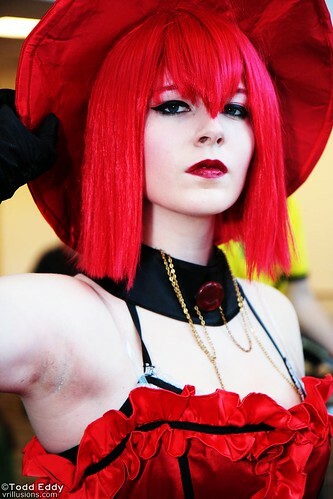 Pretty much only time I took out my camera was for Ohayocon last year. This year I'm not really planning anything too big. Maybe this year I'll do the website stuff. Also I need to get around to updating the version of Ubuntu the server is running (it's still getting security updates but some of the new fancy stuff for SSL isn't available in it). I'm also debating dropping my dreamhost account. Have a couple sites on it but none of them are high traffic or anything. Also this may be the year I drop my usenet account. Another one of those things I haven't used in years. As usual I can be found complaining about stuff on twitter and my github account is usually somewhat active. Notably I plan on doing some updates to permit cookies extension that are a little overdue, at some point. First off sorry about taking so long to get these up. I know I gave my card to a couple people I took pictures of so sorry to keep you waiting. Didn't have any photo shoots this time around and was a nice change. Didn't have to worry about meeting up with anyone, getting stressed over the photoshoots themselves, etc. I always have trouble taking pictures just roaming around. Usually it's so crowded I don't want to block the flow of traffic, even if most people don't seem to care too much. Anyway, rest of pictures can be found here. Don't really have much to say about this year's Ohayocon. I hope they figure out the line situation because it seems to get worse with each year. Number of attendees grows but the rooms are still the same size. So you wait in line and then usually fills up before you get in. Picked this picture since in my ever growing challenge to get close-up shots this is as close as I got this year. I do feel like I may have done a little too much tweaking with the levels. Straight out of camera it was really good, didn't have to touch exposure compensation or even white balance. I do have a flash shooting into a Flip-It which helped fill in shadows. With the photo shoot I did this year I again didn't feel too energetic about it and unfortunately I think shows in the results. People end up enjoying them but I always feel like I could have done better. Even in the general photos from walking around I feel like I could have done better. Maybe I need to do some more urban exploring for inspiration? Once again I went to Ohayocon. Thankfully they weren't as strict with photographers offering to do photo shoots so I got to do a couple. Like last year I had a goal of doing more close up pictures and once again failed. I think until I get something like the Canon EF 85mm f/1.8 I'm just not going to get close enough to take them. If I really wanted to I could crop a couple of the pictures so it appears like I took them closer up but I think of that as cheating. Once again I'm going to complain about the Columbus Convention Center and it being a pain to correct for white balance. I should just opt to do flash only without any ambient light. Even better would be some way to get the flash off axis as the straight on flash or maybe I'm just using then denb flip-it wrong or something. Possibly next anime con I'm going to is anime punch, not 100% sure yet.